A bell will toll across Omagh today to mark the 20th anniversary of the Real IRA attack which devastated the town. A total of 29 men, woman and children - including a mother pregnant with unborn twins - were killed. The event - falling on the date of the atrocity - has been planned in addition to last Sunday's commemoration, as it is the 20th anniversary. It will end with a symbol of hope for the future. A short service led by Omagh Churches' Forum will be opened with prayer, followed by the ringing of a bell. It will fall silent at 3.10pm, the exact time that the bomb exploded. Kevin Skelton lost his wife Philomena in the bombing and is a member of the Families Moving On support group, which is involved in organising the event. He said: "This remembrance is in response to requests from a number of people who asked us for a commemoration on the actual date of the atrocity, as it is the 20th anniversary." The commemorations will start off at 2.55pm with prayer and a hymn sung by Laura McFaul. 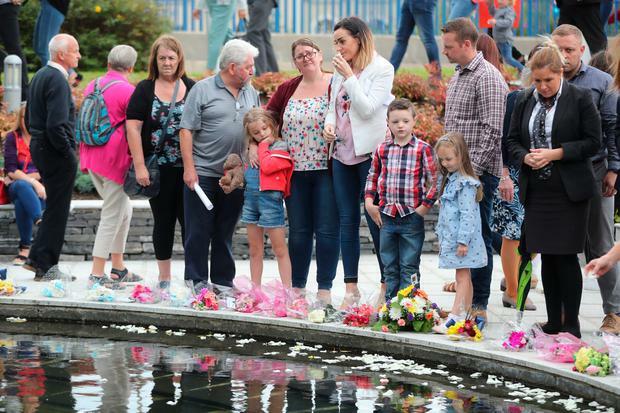 A bell will then ring 32 times to reflect the 31 lives lost in Omagh, with the additional ring in remembrance of those who have and continue to lose their lives through terror attacks across the world. Mr Skelton added: "We will have two minutes' silence at the time the bomb exploded followed by Scripture readings, prayers, hymns and a benediction led by clergy from both faiths, which has been organised by the Churches' Forum. "Our commemorations will conclude with white petals set in small boxes offered to the people who have gathered. "They are free do to what they wish with these petals - they can be dropped into the river or the pond in the Memorial Garden or they are free to take them home with them and put them in a book as a keepsake. "We want the white petals to be a symbol of hope looking forward to a better future," he said. The victims and survivors of Omagh will also be remembered today at St Anne's Cathedral, Belfast, where a two minute silence will also take place at 3.10pm -the time the bomb exploded. A total of 31 candles will be lit at the day's first service at 8.10am. The candles will sit symbolically at the base of the Cathedral's Spire of Hope. For anyone affected by the atrocity, the devastation they witnessed will never be forgotten. Speaking ahead of today's anniversary, the senior surgeon at Tyrone County Hospital on the day of the bomb recalled scenes which were "like a battlefield". Dr Dominic Pinto said he walked into "bedlam" at the hospital that day, before performing operation after operation, working to save as many lives as possible. The 81-year-old, who is now retired, recalled he had been at a father-and-son golf day with his GP and his son when he heard the explosion. "We were on the fourth hole, I had just driven off when I heard the boom," he said. "I saw the cloud of dust from the middle of the town area." Mr Pinto returned to the golf club and drove to the hospital. "When I opened the double doors going towards A&E, it was bedlam, like a battlefield, blood across the floor," he said. He recalled how everyone, from the cleaners to nurses and doctors, came together that day.